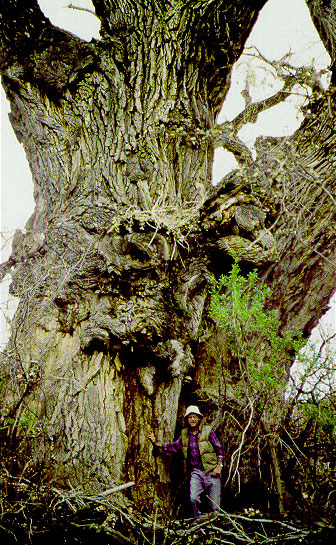 This Fremont Cottonwood is the largest specimen of Fremont Cottonwood, which also makes it the largest flowering plant in the United States. In southwest Phoenix I found many trees defoliated by the activities of a minute leaf miner that creates neat little oval holes in the leaves. The adult is a very small moth (microlepidoptera). Follow the thumb link of an affected leaf below for more information. The ant and the jumping plant lice (Psyllidae) shown below have formed an alliance in exploiting the resources on Fremont Cottonwood. The psyllid bugs draw sap and sugar, the bugs pass on sugar to the ants in exchange for protection against their own enemies. The tree might also gain some benefit from this relationship, because the ants also prey on other sorts of insects that might be eating its leaves or tunneling in its stems. TREE: In the too few protected desert riparian areas these magnificent trees grow to giant proportions producing a gallery woodland with much welcomed shade and habitat for both hikers and abundant wildlife. The deeply furrowed bark is light brown or gray. RANGE: Found throughout the Sonoran Desert wherever there is a continuous supply of water. Frequent at springs, in deep, narrow canyons, along irrigation ditches, and along rivers. LEAVES: Flattened petioles allow the large leaves to flutter with the slightest breeze, which provides cooling for the leaves during hot weather. 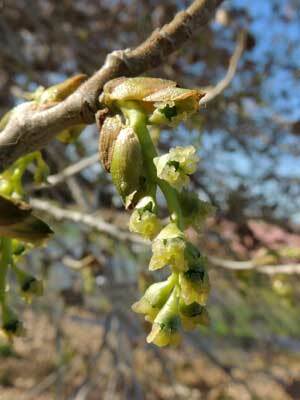 FLOWERS: Borne in short many-flowered spikes called catkins the flowers are green and without showy corollas. Blooms in early spring before the new leaves unfold. Blooming 18 February in Gilbert, Arizona, I observed many birds nipping the just-opened buds: House Finch, Ruby-crowned Kinglet, Yellow-rumped Warbler and Northern Mockingbird. Near Palo Verde, Arizona. 9 Feb 2014. FRUIT: Upon maturity the spiked fruits burst, releasing seeds copiously adorned with long, cottony filaments seeking the wind. The wind obliges and carries them off. When the fluff contacts a damp spot it collapses leaving the seed to grow. This dispersal method allows Fremont cottonwood to colonize widely scattered habitats. Mammals, birds, reptiles and countless varieties of insects make their living on and under these grand trees. By June the most conspicuous of the insects are Apache Cicadas (Diceroprocta apache). The immature mole-like cicada nymphs spend a decade or more below ground drawing sustenance from the roots of cottonwoods and other riparian trees. Upon maturity they bore up through the soil and climb a nearby trunk. With the claws firmly dug into the bark the final molt occurs and a gossamer-winged bug emerges. The fossorial (digging) forelimbs on the cast shell and the long, harmless piercing mouthparts are the few clues to its former life style. The male cycadas sing almost continuously through the day and on into the night with the intent to attract a mate. Unlike the periodic cicadas of the East and Midwest, generations of Arizona cicadas are not synchronized and thus adult cicadas emerge each year and therefore the exact length of time they spend underground is difficult to determine. Among the most spectacular insects associated with cottonwoods is the Western Poplar Sphinx (Pachysphinx occidentalis). The large hornworm caterpillar feeds on the leaves of many Populus species and the resulting moth is one of North America's largest. One cool night when I was bringing in moths with a collecting light, I was surprised at how warm this moth felt when I held it in hand. By vibrating flight muscles these insects heat up substantially, putting an end to the idea that they are "cold-blooded". On a periodic basis most groves of cottonwoods as well as willows will experience great numbers of Southwestern Tent Caterpillars (Malacosoma incurvum). The caterpillars are most often seen in late spring when great swathes of silk webbing cover clumps of leaves. Sometimes trees are completely defoliated, however the resulting harm soon fades as the trees quickly regenerate their leaves. The Yellow-billed Cuckoo is very adept at extracting caterpillars from the tent webbing but has become scarce in the Desert Southwest due to habitat fragmentation. Then with fewer birds tent caterpillar outbreaks may be more frequent and severe. In the spring the petioles of many cottonwood leaves will have spherical swellings. Hidden behind a slit on the underside is a colony of poplar petiole-gall aphids (Pemphigus populitransversus). Later these same curious aphids move to the roots of various mustards to feed and continue their life cycle.